Today is the birthday of Mathias (sometimes spelled Matthias) Leinenkugel (April 16, 1866-June 3, 1927). 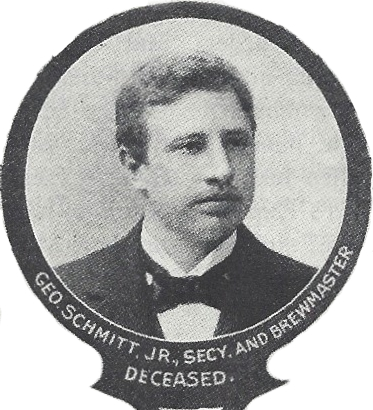 He was the oldest child of Jacob Leinenkugel, who in 1867, along with John Miller, co-founded the Spring Brewery in Chippewa Falls, Wisconsin. 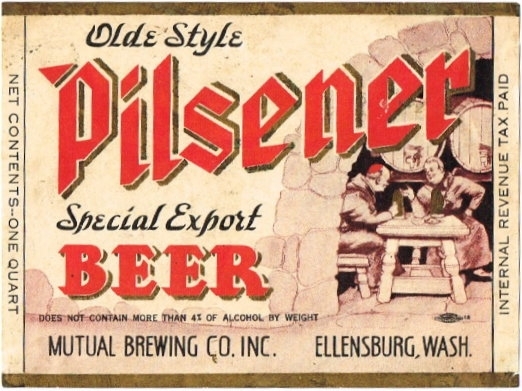 In 1884, Jacob bought out Miller and the name was changed to the Jacob Leinenkugel Brewing Co. Mathias served as president of the family brewery from 1907 until his death in 1927. Miller Brewing Co. bought the brewery in 1988, but it continues to be managed by the Leinenkugel family. Jacob Leinenkugel and his family, though I’m not sure, it seems likely that Mathias is the tall boy standing next to his seated father. Mathias “Matt” Jacob Leinenkugel was the oldest of the children born to Jacob Leinenkugel. He was born April 16th, 1866. He grew up in Chippewa Falls with the rest of the Leinenkugel family. In 1889, he married Kathryn M. Watzl. Kathryn was born in 1868 in Montpelier, Wisconsin to John and Maria Watzl. Growing up around the brewery, naturally Mathias started working there. He started work there as a salesman from 1900 to 1907. 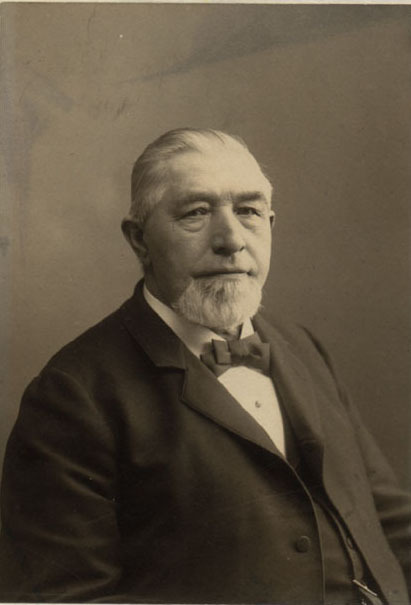 In 1907, he was promoted to President of the Jacob Leinenkugel Brewery. He stayed in this position until his death on June 3rd, 1927. Outside of the brewery, Mathias had a great family life with his wife and children. They lived at 821 North Bridge Street here in Chippewa Falls, Wisconsin. In 1890, they had their first child, Josephine Katherine Theresa. She was born December 6th, 1890. She would go on to be married twice, and have three children. 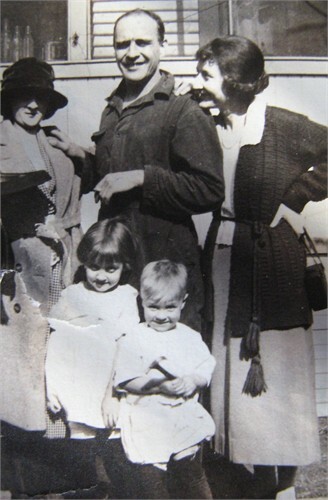 Her first marriage was to Joseph (John) Black on April 16th, 1912. They were married in Chippewa Falls and remained there after their marriage. Unfortunately, John passed away in 1932 (John Black Dies). After John’s passing, Josephine re-married on February 15th, 1941 to Thomas Gibbons. They spent the rest of their years together in Minnesota, as Gibbons was Ramsey County Sheriff until the mid-50’s. Mathias Jacob Leinenkugel was born the oldest child of Jacob Mathias Leinenkugel and Josephine Imhoff (Imhof on her death card which was all in German). He was born 16 April 1866 in Sauk City, Sauk Co, Wis. In 1867 his parents came to Chippewa Falls and his father Jacob, trained by his father Mathias in the brewery trade, began a brewery. Mathias worked in the brewery as a salesman and in the 1880’s met Kathryn M Watzl who was living in Chippewa Falls. They married at St. Charles Borromeo Catholic Church in Chippewa Falls, Wis on 18 June 1889. 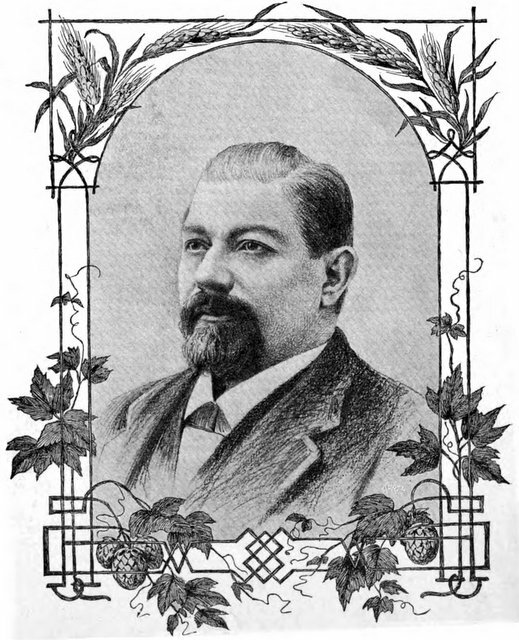 Mathias was eventually president of the Jacob Leinenkugel Brewery in Chippewa Falls. They lived at 821 N Bridge St.
Mathias and Kathryn had 3 children: Josephine Catherine Theresa Leinenkugel, Jacob Mathias Leinenkugel, and Karl J (became Carl) Leinenkugel. Mathias was ill a couple years with pulmonary tuberculosis and died in Chippewa Falls, Chippewa Co, WI on 3 June 1926 at age 60 years 1 month and 17 days of age. His death was recorded in Vol 21 page 34 of the Chippewa Co Court House records. 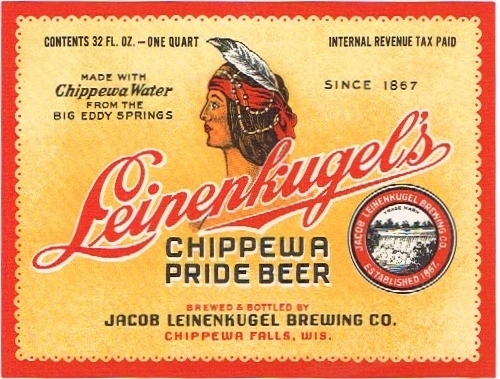 When people hear the name Leinenkugel, most would think of the beer or maybe even Chippewa Falls, Wisconsin. As the owner of Colette’s Tavern says, “Some people get hysterical when they find out I have it. The beer’s got some kind of charm.” Most, however, do not think of the rich and interesting history that has gone into the Jacob Leinenkugel Brewing Company. Most of this history comes from its origins and how over five generations, the business has kept within the Leinenkugel family. To properly tell the history of this family, we must start at the beginning with Jacob Mathias Leinenkugel himself. 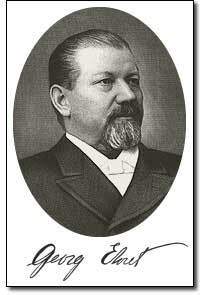 Jacob Leinenkugel was born May 22nd, 1842 in Prussia to Matthias and Maria Leinenkugel. Jacob and his entire family arrived in New York on August 2nd, 1845. They had taken a ship, the American, from Amsterdam to New York, New York. Jacob Leinenkugel was three at the time of this trip. 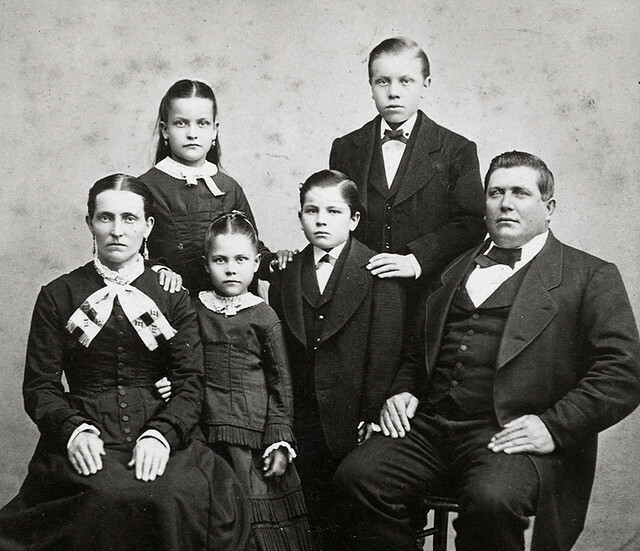 The Leinenkugel family settled in Prairie du Sac, Wisconsin and stayed there to raise their children. In 1865, Jacob Leinenkugel married Josephine Imhoff in Sauk City, Wisconsin. 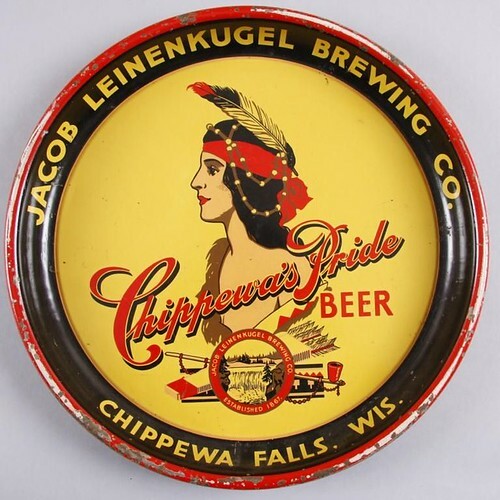 Two years later, Jacob, Josephine and their son, Mathias, all moved to Chippewa Falls when Jacob started the Spring Brewery, now known as the Jacob Leinenkugel Brewing Company. The brewery was constructed in 1867 on property along the Duncan Creek which Jacob had purchased from Hiram Allen. Jacob Leinenkugel established the Spring Brewery with John Miller. 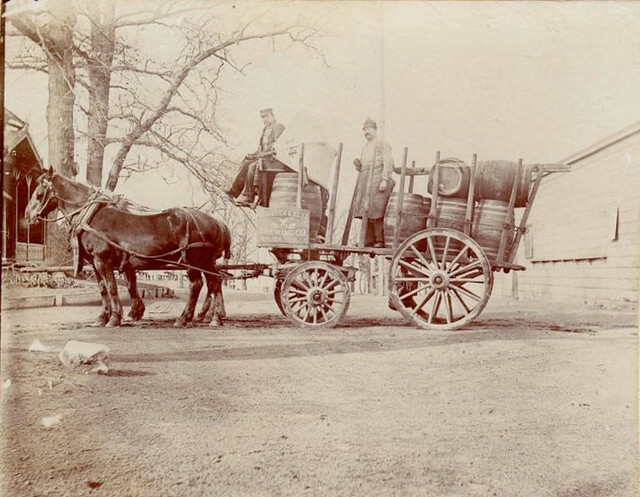 In their first year alone, they “…delivered 400 barrels…with a small cart pulled by a horse named Kate.” Originally, the Brewery only had two teams of horses, which meant they could deliver kegs of beer up to ten miles outside of Chippewa Falls. 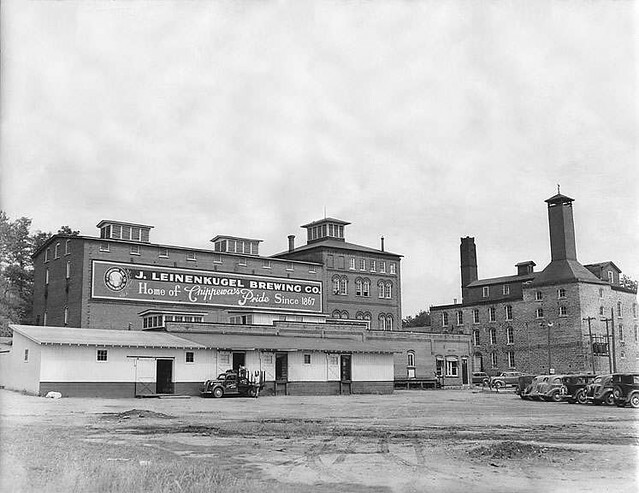 “During the early years, Jacob Leinenkugel drove the wagon himself.” The Spring Brewery was named as such because it was built near the Big Eddy Springs in Chippewa Falls. 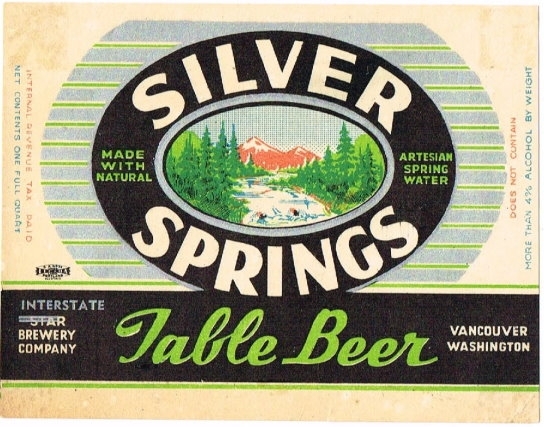 These springs “…poured nonacidic, non-alkaline water that the brewery uses without treatment to this day.” The Spring Brewery soon became the Jacob Leinenkugel Spring Brewery Company when John Miller sold his share in 1883. It is said that “Jacob Leinenkugel…was more than a brewer of Leinenkugel’s beer. Described as a noble, magnanimous man and a generous contributor to Notre Dame Church, he served two years as mayor.” Indeed, Jacob Leinenkugel was more than just a brewer. He also had a rich family life. 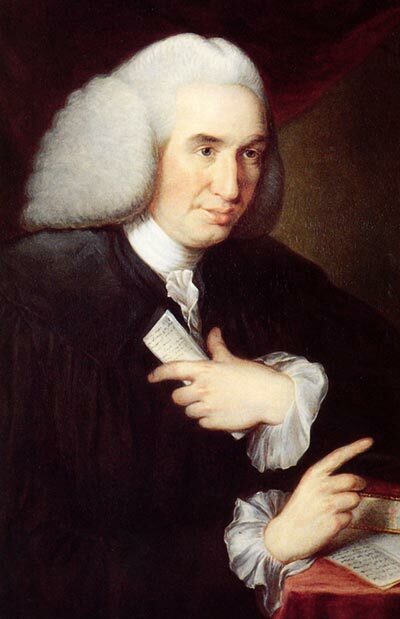 He had five children with his first wife, Josephine. The oldest, Mathias “Matt” Jacob was born in 1866. Their oldest daughter, Rose, was born in 1867. Their next oldest son, William, was born in 1870. Susan, the second oldest daughter, was born nine months later in 1870. And finally, they had one child who was born in 1873 but sadly passed away as an infant. Josephine Leinenkugel passed away in 1890, at the age of 44. A few years later, Jacob Leinenkugel re-married in 1892. He married Anna Wilson and had two children. Della, the oldest, was born in 1894 and Edward was born in 1896. Today is the birthday of Johann Sedlmayr (April 9, 1846-November 24, 1900). Johann was the grandson of Gabriel Sedlmayr and the third son of Gabriel Sedlmayr II. Johann’s father inherited the Spaten Brewery, along with his brother, when his father died, but Gabriel became sole owner after his brother Joseph left to start his own brewery, Franziskaner. Two of Johann’s older brothers died before their father, so when Gabriel II passed away, he and his younger brothers Carl and Anton inherited the family brewery. Today is the birthday of Henry B. Lembeck (April 8, 1826-July 26, 1904). 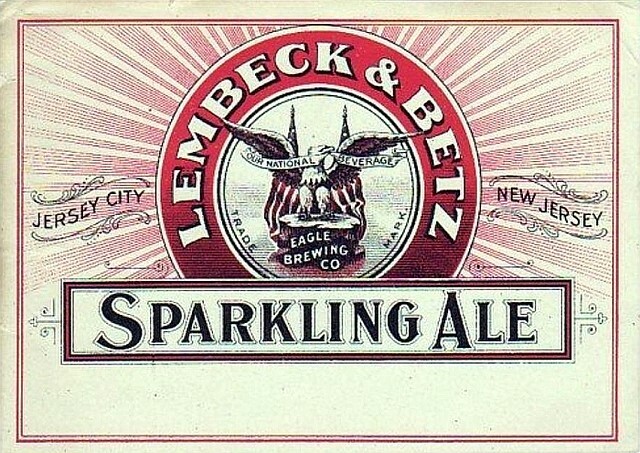 He partner with John F. Betz (whose birthday is also today) to start The Lembeck and Betz Eagle Brewing Company in 1869, in Jersey City, New Jersey. It was originally known as the Henry Lembeck & John Betz Brewery, but changed its name to the Lembeck & Betz Eagle Brewing Co. in 1890. 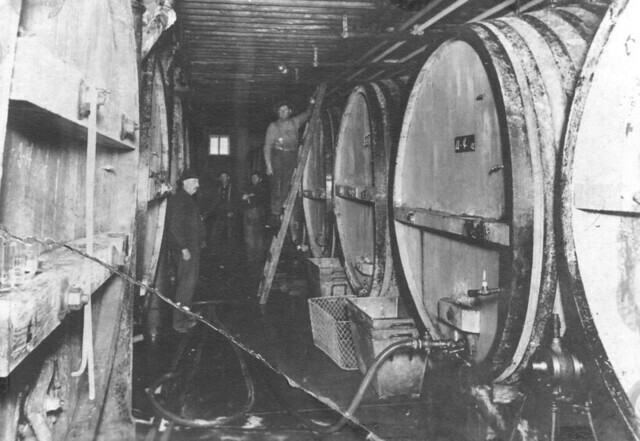 The brewery operated until prohibition in 1920. 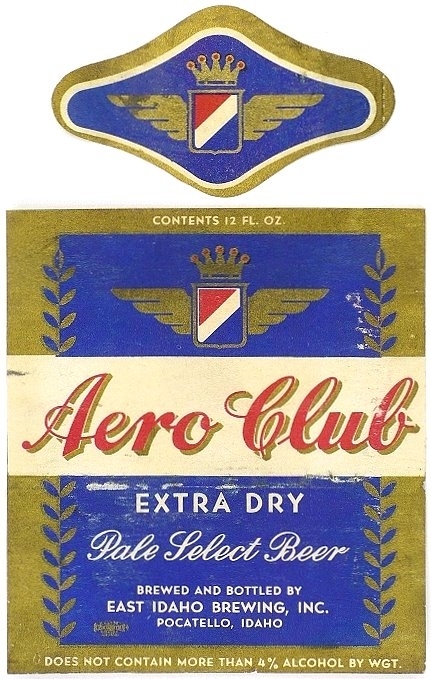 It was licensed in 1933 to begin brwong beer again, but never did so, effectively meaning it closed in 1920, or 1933, depending on how you want to look at it. 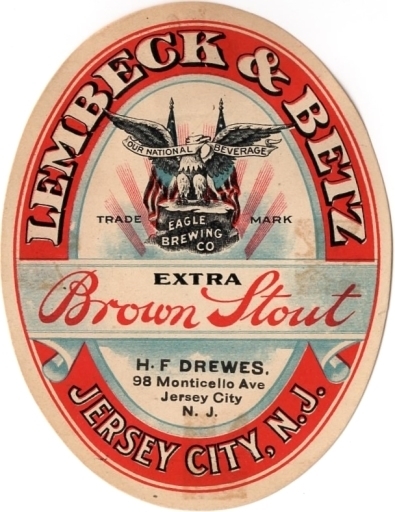 In 1869, Lembeck moved across the river and established a brewery with Betz in downtown Jersey City, New Jersey. 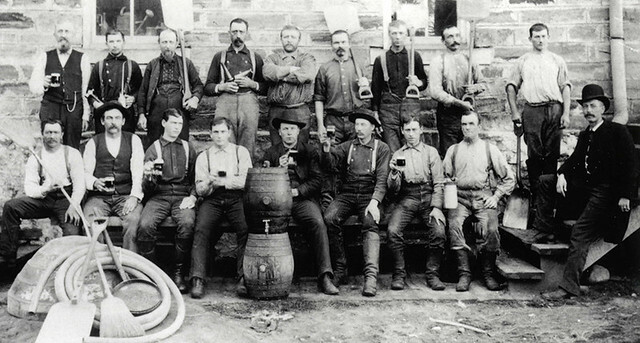 The Lembeck and Betz Eagle Brewing Company would develop into one of the most successful breweries in the eastern United States producing a quarter of a million barrels of beer a year. As Lembeck grew financially successful, he also helped establish banks and real estate companies in Jersey City. Lembeck was the founder of the Greenville Banking and Trust Company and a director of the Third National Bank. He helped develop the township of Greenville (today it’s a section of Jersey City) through real estate development of undeveloped land. Lembeck discontinued home building over a dispute with the city regarding the quality of water supplied to the Greenville area. After his retirement his son Gustav took over running the brewery. 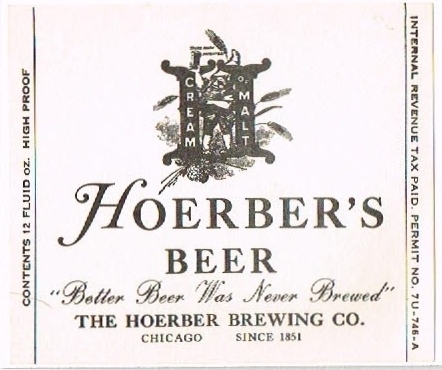 The brewery closed during Prohibition in 1920 and later went out of business. He lived in Greenville with his wife Emma and children in a mansion on Columbia Place, which has since been renamed Lembeck Avenue. Lembeck died in Jersey City and is buried in Bayview – New York Bay Cemetery in Jersey City. The Lembeck mansion was later donated by his widow to St. Anne’s Home for the Aged. Henry Lembeck was born near Münster, Germany. At the age of 20, he was drafted into the army, but deserted during the German Revolution of 1848 and immigrated to the United States in 1849. Living in New York City, he worked first as a carpenter and than as a grocery clerk. In a few years, Lembeck set up his own successful grocery business. 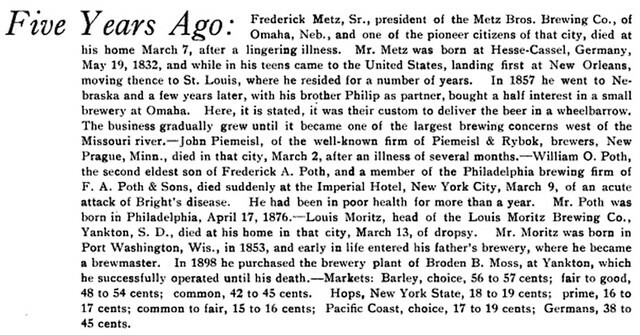 It was then that he met a successful brewer, John F. Betz. 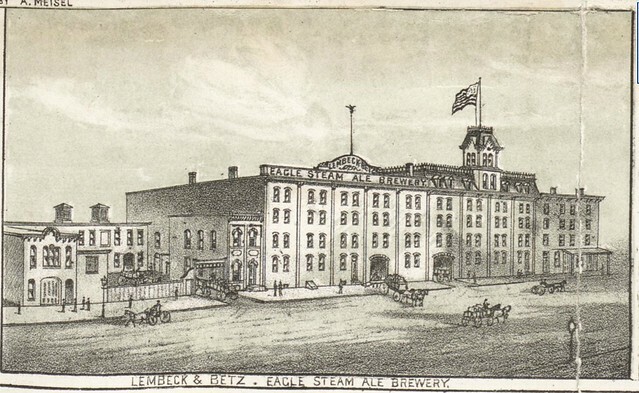 In 1869, Lembeck moved across the river and established a brewery with Betz in downtown Jersey City. 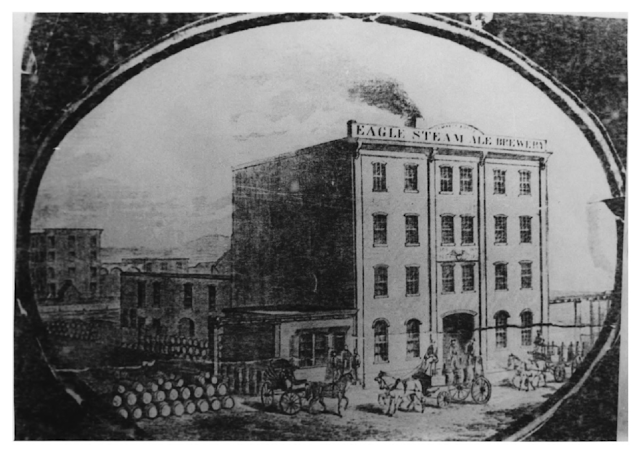 The Lembeck and Betz Eagle Brewing Company would develop into one of the most successful breweries in the eastern United States producing a quarter of a million barrels of beer a year. As Lembeck grew financially successful, he also helped establish banks and real estate companies in Jersey City. His son Gustav took over running the brewery. He lived in Greenville (now part of Jersey City) with his wife Emma and children in a mansion on Columbia Place, which has since been re-named Lembeck Avenue. Henry Lembeck is of German parentage, his father having resided in Osterwick, Munster, Germany, where he followed the trade of a cabinetmaker. He married Elizabeth Wenning, of the same town, and had children, Elizabeth, Catrina, Bernard (deceased), Henry and Joseph. Henry was born on the 8th of April, 1826, in Osterwick, where he remained until eighteen years of age. 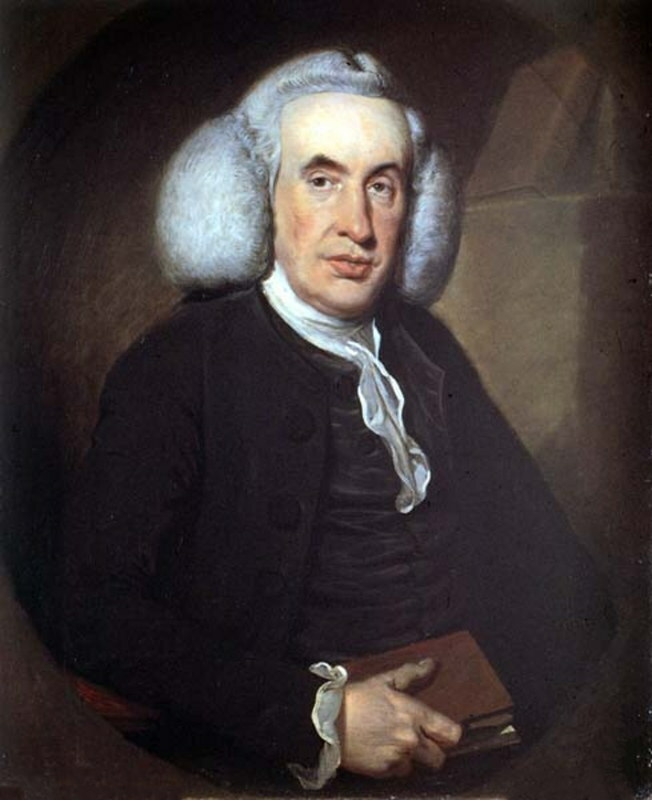 He received in youth a rudimentary education, and on the death of his father, when his son was fourteen years of age, became an apprentice to the cabinet-maker’s trade, serving three years in that capacity. For two and a half years he was employed as a journeyman, when, being drafted into the German army, he did duty as a soldier for two and a half years. His strong love of liberty, however, found expression in the revolutionary sentiments declared by him, which rendered his presence in his native land uncomfortable. He was therefore induced to emigrate to America, and on landing in New York at once resumed his trade, that of a cabinet-maker. Jersey City then became his place of residence,after which he became the agent for the sale of the ale made at the brewery of John F. Betz, of New York. 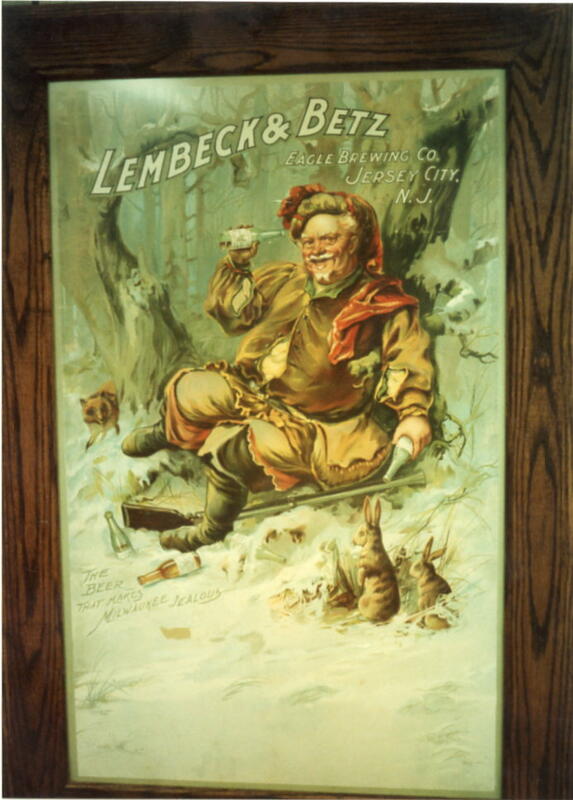 This was continued until 1870, when, in connection with John Betz, he established the firm, of Lembeck & Betz,of which ale is the staple product. They speedily won an extended reputation for the excellence of their ale, and created a wide demand for it in New York City and the vicinity. He was for four years a member of the Board of Public Works of Jersey City, two years of which period he was its president. He is also a director of the E.B. Parsons Malting Company of Rochester, N.Y. He is in religion a Catholic, and identified with St. Paul’s Catholic Church of Greenville. 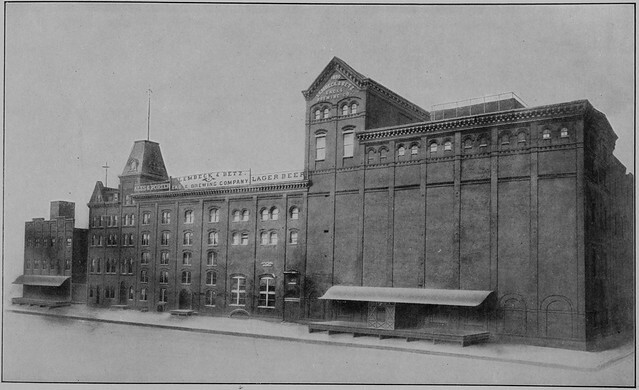 The Lembeck and Betz Eagle Brewing Company in 1910. 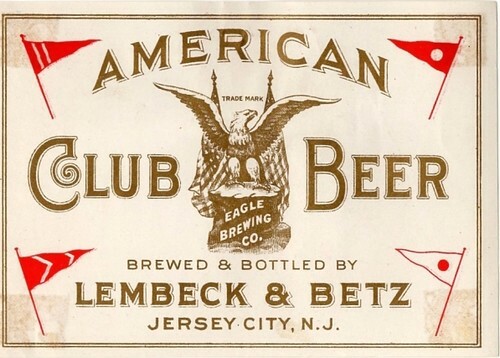 The Lembeck and Betz Eagle Brewing Company was founded in 1869 by Henry B. Lembeck and John F. Betz in Jersey City, in Hudson County, New Jersey, United States. 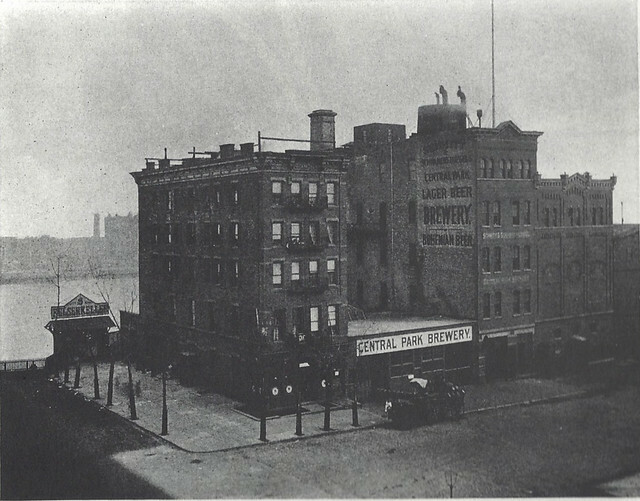 The brewery, bounded by 9th, 10th, Grove, and Henderson streets in downtown Jersey City, developed into one of the most famous, best-equipped, and financially successful breweries on the East Coast of the United States. 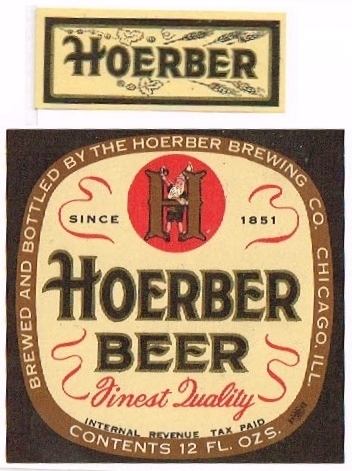 In 1889, Lembeck started producing lager beer in addition to the traditional pale ale they had been brewing. The brewery grew through the later part of the 19th century, eventually occupying seventeen city lots. The company was incorporated in May 1890. 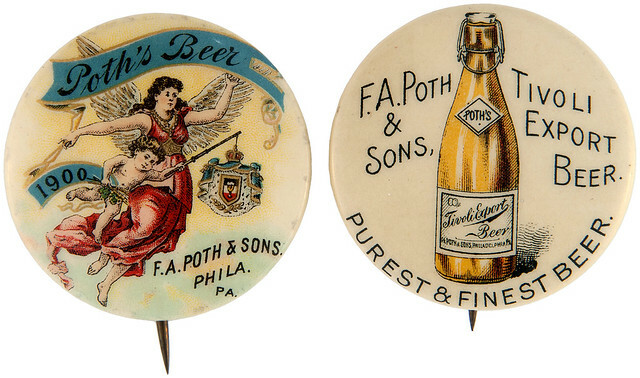 Since 1869, the brewery grew to become the fourth-largest brewery in New Jersey. 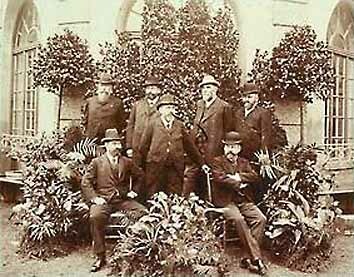 Lembeck died in 1904 and his sons Gustav and Otto took over running the brewery. The brewery closed during Prohibition. The facility was later sold and converted into a refrigeration plant. In 1984, the area was designated the Lembeck and Betz Eagle Brewing Company District on the National Register of Historic Places. 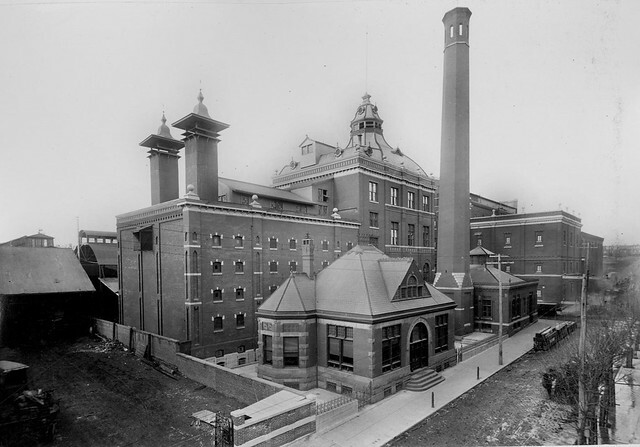 The brewery buildings were demolished in 1997.
Business partners Henry Lembeck and John F. Betz founded one of the most famous, best-equipped, and financially successful breweries on the East Coast of the United States. By 1889, it manufactured fifty thousand barrels of ale and port and 250,000 barrels of beer per year in a state of the art facility valued at a million dollars and worth three million dollars in total assets. After working as a carpenter for the Herring Safe Company in New York City, Lembeck became the clerk to a grocer; and three years later he bought his own business that developed from a grocery store to a market-gardening firm. 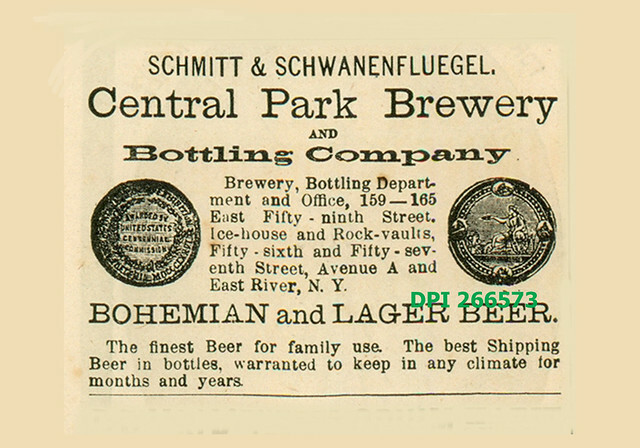 While his business flourished, Lembeck also became a sales agent for the brewery of John F. Betz of New York. 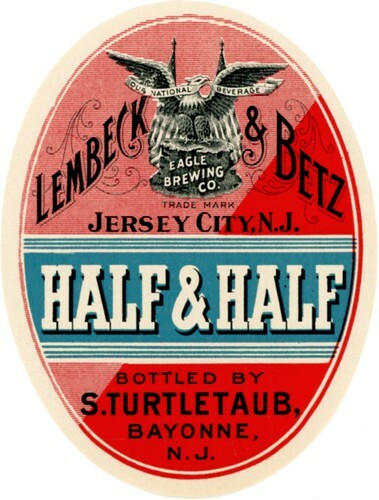 In 1869, Lembeck moved to Jersey City and established with Betz a brewery to manufacture ale and porter on Ninth Street. 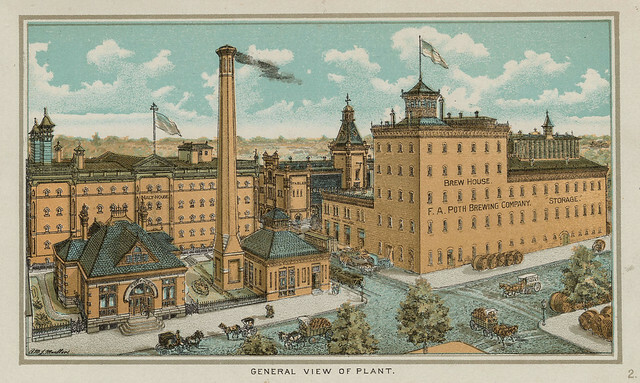 The Betz family had already established a reputation as brewers both in the United States and Germany. 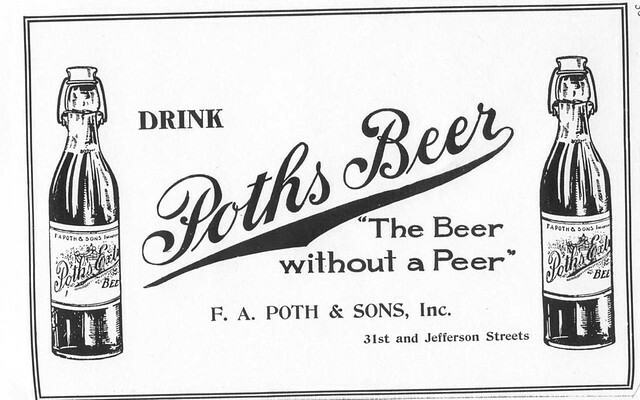 With Lembeck’s newly acquired business savvy and Betz’s background in the production of ale and porter, the partnership was established on sound footing. The Jersey City brewing facility and operation expanded. 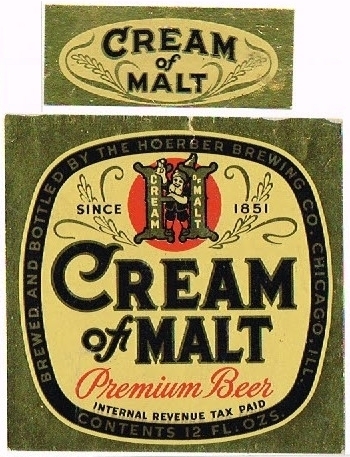 Lembeck astutely noted the diminishing taste for ale in the United States, and in 1889 added the production of the more popular beverage of lager beer to the business. 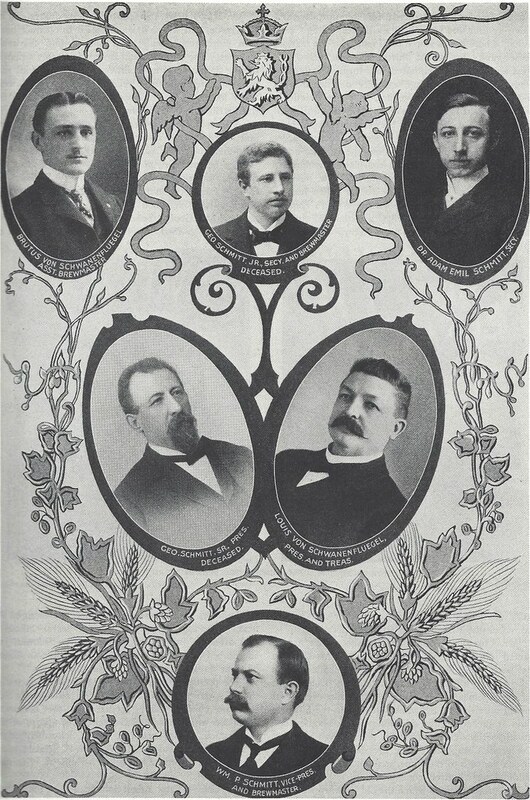 Lembeck became president of the company and incorporated the brewery into a cooperative stock company in May 1890. 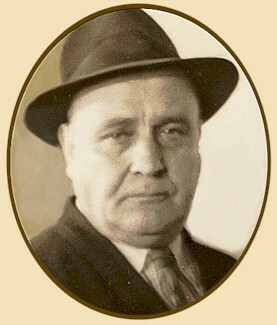 Betz was the vice president of the company. 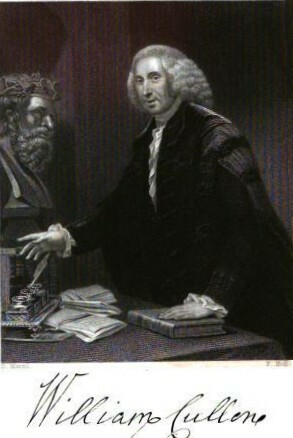 A biography of Lembeck states, “[he] had the complete management of the business, assumed full responsibility of its direction, and consequently must receive the credit for its success and growth” (“Biography of Henry B. Lembeck,” 2). 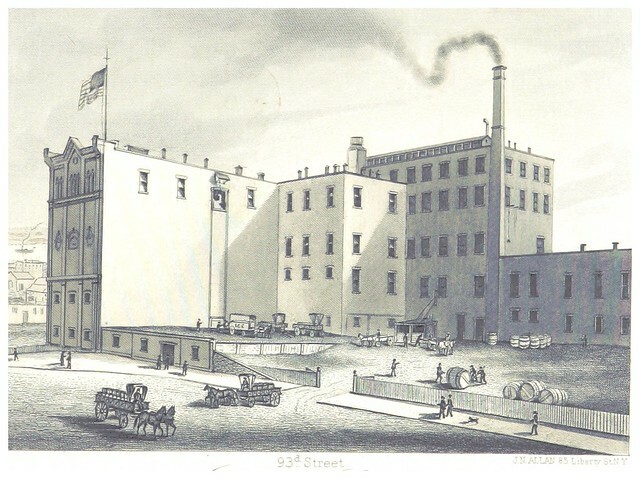 The brewery’s physical plant begun on Ninth Street was enlarged to accommodate the required refrigeration and storage of beer and eventually occupied seventeen city lots. A malt house, H.F. Lembeck & Company at Watkins, New York, at the head of Seneca Lake, complemented the brewing firm. Along with his business success, Lembeck took a strong interest in the Jersey City, his permanent residence. He was one of the founders the Greenville Banking and Trust Company, became vice president of the Third National Bank of Jersey City, and served with other corporations such as the Hudson Real Estate Company of which he was a director. In 1898 Lembeck built the Hudson Building at 13-15 Ocean Avenue. The stone Romanesque Revival structure at the corner of Lembeck and Ocean Avenues consecutively housed the Hudson Real Estate Company and the Greenville Bank and Trust Company with which he was associated. After a renovation in 1970, the Hudson Building became a 22-unit apartment. Lembeck owned large tracks of land in Greenville and helped with its development. He donated property for the extension of Columbia Park (today Bartholdi Avenue). His earlier carpentry training prompted him to build a reported 32 to 43 houses in Jersey City prior to 1895 and to participate in their construction as both architect and supervising contractor. Lembeck discontinued home building over a dispute with the city regarding the quality of water supplied to the Greenville area and complained of the loss of tenants willing to rent his properties. Lembeck lived in the home that he designed at 46 Columbia Place (today Lembeck Avenue) and Old Bergen Road. The modest-looking red brick structure has a decorative cornice painted gray with dentil molding and corner brackets. The center section of the house features a recessed gray wood and glass door reached from the concrete riser and has an open pediment supported by brackets over a double window with semicircular transom; the adjoining sections of building are topped by pyramids over the roofline. The Lembeck mansion was later donated by his widow to St. Anne’s Home for the Aged at 198 Old Bergen Road and serves as the administrative building; St. Ann’s became part of the York Street Project, run by the Sisters of St. Joseph of Peace, in 1987. Lembeck died at his residence on July 25, 1904; he was president of Lembeck and Betz at the time of his death. He is buried in the family plot in the Bayview-New York Bay Cemetery. Today is the birthday of George Ehret (April 6, 1835-January 21, 1927). He was born in Hofweier, Buden, Germany but followed his father to America, arriving in New York in 1857, age 31. 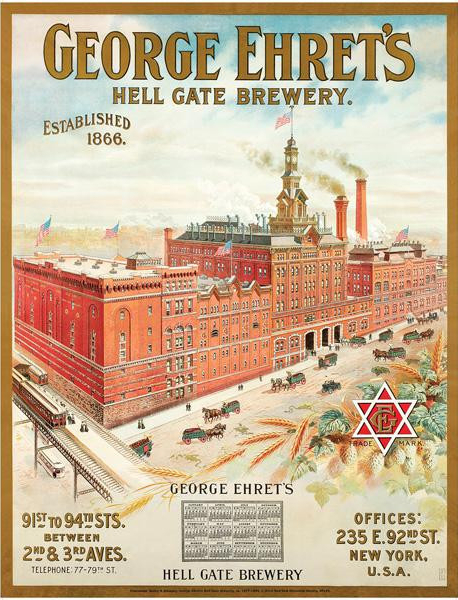 Having been trained as a brewer, he worked for a few years and then founded his own brewery, the George Ehret Brewery, which was also known as the Hell Gate Brewery, in 1866. 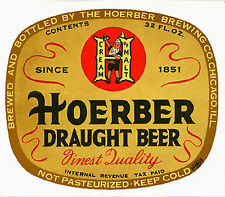 It stopped producing beer in 1920 due to prohibition and limped along until 1927, when it closed due to his death. 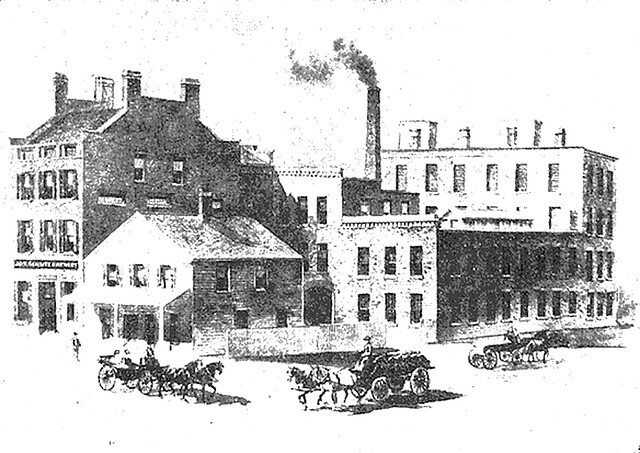 George Ehret’s Hell Gate Brewery, New York City. The Hell Gate Brewery was established by George Ehret in the year 1866; hence, at a time when the annual production of malt liquors [in the U.S.] had increased to 5,115,140 barrels. He had then just attained the age of thirty-one years, the date of his birth being April 6, 1835. 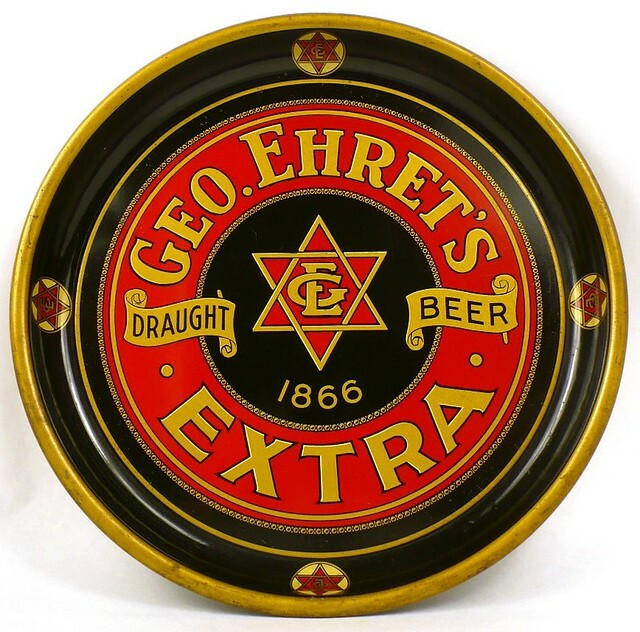 Nine years before the establishment of this brewery, Mr. Ehret came to America (1857) to join his father, who had emigrated from Germany in August, 1852. Mr. Ehret, being a thoroughly practical brewer, strictly devoted to his calling, had not long to serve in the brewery of A. Hupfel before he rose to the foremanship and gained the full confidence and friendship of his employer. When he made known his intention to start a brewery for himself, Mr. Hupfel, a man of generous instincts and philanthropic disposition, at once promised and, at the proper time, gave his support and assistance to the new enterprise. The building in which he began brewing was erected under his supervision on the lower part of the block, between Ninety-second and Ninety-third streets and Second and Third avenues, and its interior appointments were completed at the beginning of the year 1867. This building is no longer standing. It was succeeded by another in 1871, which formed the nucleus of the establishment that now covers the greater part of an entire block. It is at present almost hidden by the over-towering brewery buildings which have sprung up around it in the course of a quarter century, and a full view of it can only be gained from the quadrangular yard, of which it forms the interior side, the buildings flanking it being the offices and the storehouse, both fronting on Ninety-second street. Mr. George Ehret, from the very beginning, aimed at the brewing of a beer as nearly like the best quality of Munich lager as the difference between our water and that of the river Isar would admit. How well he succeeded in this may be inferred from the popularity which his beer attained in a few years. As has been said, he began brewing immediately after the completion of his plant. At the beginning of January, 1867, the first brew was stored in the cellars; in March of the same year his wagons, freighted not only with kegs, but also, metaphorically speaking, with all his expectations and anxieties, left his yards for the first time to serve his new customers. Five years after that date he sold 33,512 barrels; seven years later, 74,497 barrels, and in 1874 he produced and sold 101,050 barrels — a quantity which twenty-eight years ago was manufactured by but very few of the largest establishments. This growth was then all the more remarkable, because Mr. Ehret’s operations had suddenly been checked for a considerable time on account of a fire which, on the 19th of September, 1870, destroyed the greater part of his brewery, including books and papers. It is owing to this fact that we are unable to give the quantities of beer brewed during the four years preceding the fire. The year 1870 may be called the second starting point in the growth of Hell Gate Brewery. In a certain sense the fire was not an unmixed evil, especially in view of the fact that the demand for Ehret beer was fast outgrowing the capacity of the original plant, necessitating a considerable extension of the premises and buildings, and many additions to the machinery and other appointments. 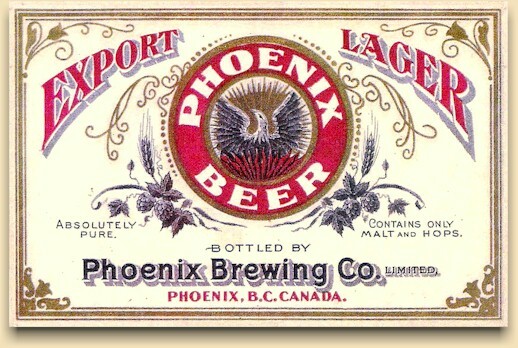 As stated above, the amount of beer produced and sold by the Hell Gate Brewery in the year 1874 amounted to 101,050 barrels; in 1880, the production amounted to 220,096 barrels, an increase in six years of over one hundred per cent. Ten years after, in the year 1890, the production amounted to 412,851 barrels, making another increase of almost one hundred per cent for the decade. In the year 1900, the production was 601,000 barrels, showing an increase of about forty-six per cent. This is a record to be proud of, and one that has seldom been equaled in the history of brewing. This immense production has been attained without any forced efforts to open new channels outside of the limits of the State of New York; although, naturally enough, whenever a demand was shown to exist in outside markets, Mr. George Ehret endeavored to supply it, and thus established a number of agencies. The home demand always proved so great that the idea of engaging in an extensive export trade beyond the sea could not be entertained, save in conjunction with plans for a further enlargement of the brewery premises and increase in equipment. On approaching the brewery, one is impressed at the very first glance with the unusually large dimensions of the grounds upon which the buildings are erected. In a smaller city this would not be anything worthy of note, but in New York, and especially in that part of it to which we refer, where scantness of territory and an immense and ever-growing population render necessary the utmost economy in the utilization of space (much to the detriment of architectural beauty), such extended premises as those we speak of can not fail to make an impression. The grounds, extending from within a short distance of Third avenue to Second avenue, and from Ninety-first to Ninety-fourth streets, comprise, inclusive of stables and storage buildings on Second avenue between Ninety-first and Ninety-third streets, seventy-five city lots, or one hundred and eighty-seven thousand five hundred square feet. The main building, an imposing structure, surmounted by a graceful clock tower, fronts on Ninety-third street, extending southward to a considerable depth; it is flanked on either side by lower wings, which, in point of architecture and symmetrical proportions, harmonize perfectly with the principal facade. Ornamental gables, rising from the cornices of every building, enhance the impression of uniformity which, next to utility, was manifestly one of the prime objects of the architect. George Ehret, once this nation’s largest brewer, passed away in January of 1927 (leaving an estate valued at $40,000,000!). 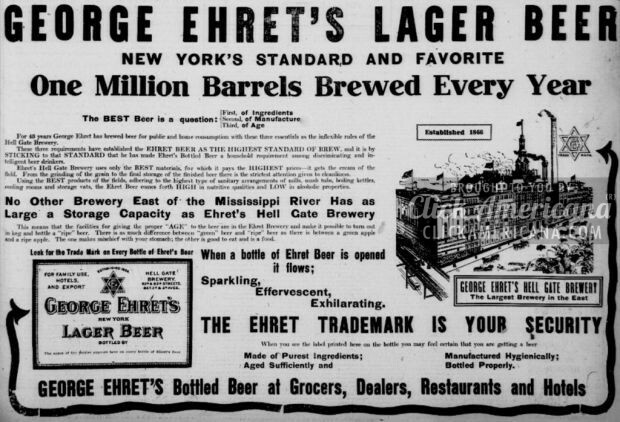 It was beginning to look as if Prohibition would last forever and the executors of Ehret’s estate debated whether they should sell the mammoth brewery buildings on the upper east side of Manhattan. For years they held off but in April of 1935 Col. Jacob Ruppert, Ehret’s neighbor on Third Avenue and 92nd Street, made an offer that the Ehret family just couldn’t refuse. With the sale to Ruppert, the Ehrets had even more money to add to what they’d inherited earlier — but they had no brewery. This problem was solved very nicely by the cash purchase, in July of 1935, of the Interboro Beverage Co. facilities [in Brooklyn]. Although the location was new, the brewery was still very much under the control of the Ehret family. 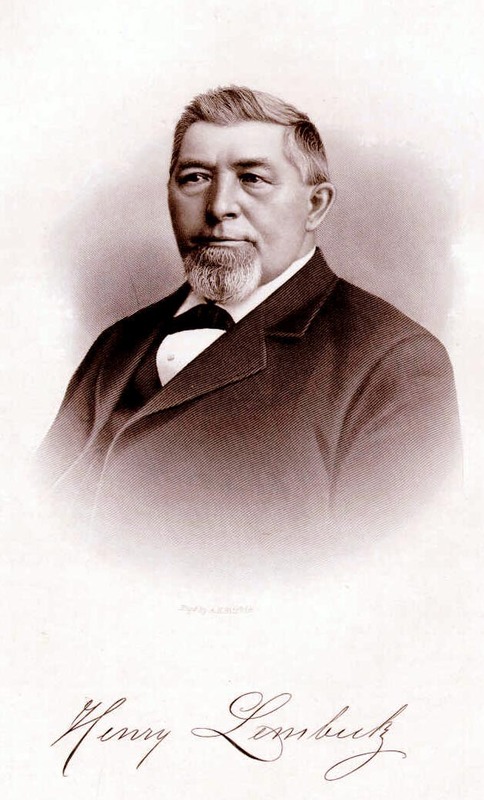 Louis J. Ehret, George’s son, headed the firm, and he was aided by two of George’s grandchildren, George Ehret Burghardt and William Ehret Ottmann. Richard Barthel, brewmaster at the old Ehret plant in Yorkville, also made the move to Brooklyn. Over $200,000 was spent to thoroughly recondition the plant throughout, and by the summer of 1936 Louis J. Ehret had the plant in full production. 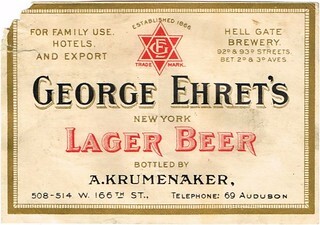 Ehret’s Extra Beer and Ale were brewed in Brooklyn for the next 12 years, until 1948, when the company transferred its operations to Union City, New Jersey. 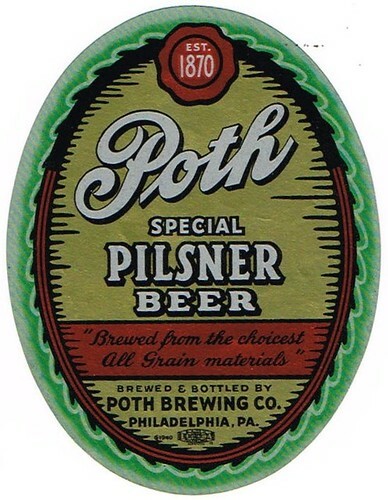 Whether Ehret’s moved because of an irresistible offer from Schlitz [who bought the Brooklyn plant] or because the Union City plant seemed preferable is unknown. In any case, move to New Jersey they did, where they remained in operation but three more years. And finally, here;s George Ehret’s obituary.